I embraced the name with pride, and thus a whole category on this blog was born. I get that they didn’t cause the Texas Rangers to lose. But all series, I held my tongue (OK. Not really), promising myself that, if the Rangers won I’d just let their barely concealed homerism slide. Victory alone would be the dish served cold. Then, Game Six happened. And I cried buckets of tears last night. In this I am not being bitter or sarcastic. You can ask Dennise. Real tears. Not ashamed to admit it either. So when it came to tonight’s Game Seven, I was pretty sure we were going to lose. (Although I was hoping for the ’75 Cincinnati Reds-mojo…) So, I approached the game with Zen-like calm. And, on Facebook, my gloves came off. The Bitter P-1 (all cried-out from the night before) blew up in full force. Look. I know you Cardinal fans are glad you won. I get that. Delirious, even. I am sure. Good for you. But, for cryin’ out loud, it’s your ELEVENTH title. That’s one every eleven years of your storied franchise’s existence. Second only to the Yankees who, on average, win every four years. I used to like you guys. I really did. But, now you’ve beaten us, and Joe and Tim got me thinking deeply about those eleven titles. So, sorry St. Louis, the thrill is gone. …The Texas Rangers/Senators are currently tied (with the Astros) for the third longest drought in terms of World Series titles. …The Cubs and Indians have far longer droughts, year-wise. But…both have previously won titles. To review, the last time the Rangers won? How does “never” feel? Oh, right…you have no idea!! No it isn’t. Not really. Just three other teams, statistically. So, yes, along with our sadness, there’s a whompin’ big pile o’ bitter mixed-in tonight. — The only team to lose a lead in a World Series game five times in one game. — The ONLY team to be ONE STRIKE AWAY from winning a Series… not once, but TWICE in one game. Think about it. One. Strike. Away. Not one out. One strike. Not once. Twice. In one game. In two innings. Do you know how improbably horrible that is? And it’s not like we have one guy we can focus on (right or wrong), like Bill Buckner (even though everybody forgets the Sox blew a lead that next night…) It was our whole team that contributed to this…errors…horrible bullpen pitching…anemic hitting. One. Strike. Away. Two times. We’ll be reliving this in our dreams. Yes, it could have been different. But it wasn’t. That is our history now. Until such time as the Texas Rangers finally win a World Series, Game Six last night will haunt us all. I don’t want it to. I just know, factually, that it will. So, yes, “The Bitter P-1” was on a rampage earlier tonight. No apologies for that. It’s a part of the process. But here’s the thing. The minister in me pastorally reminds myself that behind each bitterness there’s real sorrow and sadness. 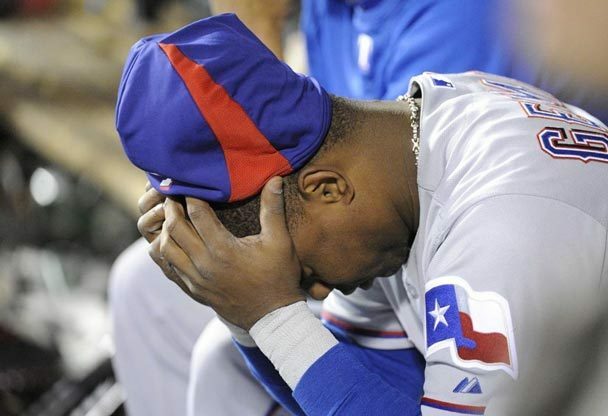 My sorrow and sadness was last night, after the Rangers lost Game Six. I cried quite a bit, actually. I mean, can you imagine how it felt for us 40-year Rangers fans imagine the moments we thought were about to erupt? Our guys jumping across the field? Forty years of futility erased in one fell swoop? Redemption finally come to everyone? And then, in an instant, it was gone. Twice. I knew the moment the Cards won last night that it was gone. I knew we’d lose tonight. If the our own Roy “Hamilton” Hobbs Jr couldn’t’ pull out a storybook ending with his homer in the 10th, I knew the dream was over. And it was such a sudden and dramatic reversal that I just cried. I was eighteen. 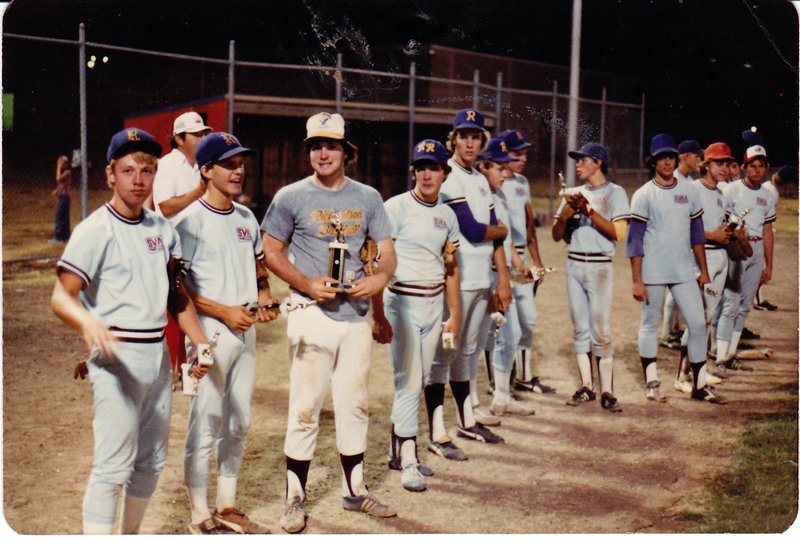 I was a part of a summer-league baseball team, here in North Dallas (SVAA) comprised, mostly, of guys that were on the Richardson High School team too. I hadn’t made my high school team. That, in itself, had been a big shock. I’d figured I would. I had this crazy dream –as millions of boys have– that, somehow, I’d be a major leaguer one day. I know. Looking back now, in unflinching 20-20, it was ridiculous. But baseball is a game of ridiculous dreams. Our team was pretty good. We actually made it to the championship our junior year. We lost to a pitcher who, we were told, was going to A&M on a baseball scholarship. So, we felt pretty good about ourselves. We figured we’d “get ’em next year” during our senior year. We cruised into the playoffs, against the bottom seed in the bracket. But it was there, incredibly, that we lost in the first round. We were stunned. It was not how our “story” was “supposed” to unfold. We were “supposed” to be champs that year. It was our year of redemption. It was our final year in a sport that had nursed our fantasies since we were little boys. Standing there alone in my room, it suddenly hit me like a ton of bricks: this would be the last time I’d ever take off a baseball uniform. Maybe I’d play college intramural softball. Maybe I’d play some adult softball league. But that barely-alive fantasy, that dream of childhood, nursed into my late teens, was about die forever in that moment. So I took off a baseball uniform for the last time in my life. And I cried big buckets of tears, alone. Last night reminded me of that moment, all those years ago. We grow up, and if baseball was once our dream, most of us eventually realize it’s not gonna happen for us. And so, we cheer for our teams instead. We hope that THEY can win for us; do what we never will. Every year, you get to dream of redemption, whatever that means for you, whatever memories you carry inside of you. Every April, like Spring itself, hope is eternal. And, if you’re lucky, every now and then, your team wins it all, and there are moments of substitutionary redemption. In the years that passed after I last took off that uniform, I came to understand a truth that you’ve probably heard before: Baseball is a game that is far more about losing than it is about winning. In fact, it’s probably the only major sport designed that way. And I know this. I really do. But damn it all, I just thought, for once, my team was gonna win. I thought redemption would finally come. So, no, I don’t apologize for either that foolishness, or for my bitterness now. In fact, the reality is that just writing-out all this tonight has erased most of my own bitterness. In a few moments, I’ll push “Publish,” take off my “lucky” official Pudge Rodriquez jersey, and put it away until next year. Here’s the truth below either sadness OR bitterness: I am SO proud of these Texas Rangers. I am so proud that they have made it to the Series, two years in a row. That’s SO amazing. I know that. Really. Promise. And I have every faith in the world that they will be back. I believe in God, Jon Daniels and Nolan Ryan. (Yes. In that order). Someday, we will get there. Someday, even Game Six will be redeemed. It has to be. I know it. And until then? At least I’m not a Yankees fan. Or, as I realized this series, even a Cardinals fan. What can they possibly know of this experience? Of the life-lesson of 50 losing seasons without redemption? Of what it really means to learn to live with losing? Nothing. I don’t expect them to. Past the bitterness, the bitterness passes. It always does. And there becomes an honor in losing. There really does. So, if you’re bitter about it tonight, I suppose I’m here to say that that’s OK right now, so long as you don’t stay there. Because in life, as in baseball, if you choose to live out of the lessons that losing teaches you –the lessons suffering teaches– that in itself becomes a step down the road toward redemption. Tonight, more than ever, I am proud to be a Texas Rangers fan. Anyone who has suffered through the struggles of a favorite team understands how you feel (although, by the way, not everyone forgets about the outcome of the 1986 World Series).I have been a Green Bay Packers fan since I was a child. Yes, they are enjoying success today, but, from the late 1960s until the early 1990s, the Packers made it to the playoffs only twice and went three decades between Super Bowl appearances.During those three decades, the Packers rarely had a winning season. I lived through more three- and four-win seasons than I care to remember. I know it is painful. But it DOES make victory that much sweeter.I'm not sure I agree with your assessment of McCarver and Buck. I think your reaction stems from more than the fact that Buck's father announced Cardinals games for many years and that McCarver played for the Cardinals.That kind of thing happens. For example, Troy Aikman often announces Cowboy games. To rigidly hold him (or McCarver and Buck) to the standards I would expect from a trained journalist is ridiculous. Aikman and McCarver are not journalists. They are former athletes who were hired to lend their insights from their playing careers.I'm not sure how I would classify Buck, but I don't think someone who does play by play on the radio or TV is the same as a news gathering journalist. It's usually much more opinion than anything else.And that's OK with me because a sporting event isn't the same as a presidential/congressional decision or non-decision.Some people have suggested that the announcers influence how viewers perceive the teams and players. Well, what does that have to do with the outcome of the game? And, if you're on the winning team, what the hell do you care what the opposing fans think? Sports isn't a democracy. This isn't even American Idol. No one is voting a team out of the World Series. Having said that, though, I do understand (as a Packer fan of long standing — as well as a lifelong fan of the Dodgers, who haven't been to a World Series in nearly 25 years) how Ranger fans are feeling.And all I can say is that the suffering will end eventually.It may or may not end in your lifetime, but it will end someday.I had a friend who was a Boston Red Sox fan all his life, and the Sox went to a few World Series in his life, but they never won it while he was alive. After the Sox finally ended their nearly century-long title drought, his friends and family went to the cemetery and placed a Red Sox cap on his grave marker.The Rangers have taken great strides in the last few years. They've earned a lot of respect from baseball fans — whereas, before, they were usually the laughingstock of major league baseball. They've proven that they are not a flash in the pan.They will be back.And one day they will win it all — regardless of who is sitting in the booth. David: I believe I recall you, or someone else, telling the story of the ballcap on the grave.As for McCarver and Buck, as I say in the blog itself, it clearly does not influence the outcome of the game. And, in a regular season game, it probably doesn't matter all that much. Somehow, the World Series feels different…I and acknowledge I'm taking feelings here. Somehow, having not one, but two, announcers with Cardinal ties? That seemed a little much. Joe Buck got his professional start with the Cardinals too. I wouldn't expect them to pick Verne Lundquist to announce a Cowboy's Super Bowl either…that would be weird. As my other blog during this series indicates, probably a lot of my frustration here would wane if either man would simply admit that, yes, it's weird. Don't act like you're some robot who doesn't care at all. Nobody buys that. Have the courage to come out and admit your ties…. "In in the interest of full disclosure," and admit that, yes, in your hearts, you still bleed some red. (Cardinal red…)Somehow, I could take that much better than them pretending like they're NOT rooting for the Cards, or that it doesn't matter to them. Well, while we're on the topic of the Super Bowl …Kyle Rote did the color commentary for the Cowboys' first Super Bowl. He didn't play for the Cowboys, but he clearly had local ties, having played for SMU.When the 49ers played in their first Super Bowl, former 49er QB John Brodie was a "sideline reporter" during the game.When the Raiders played the Redskins, former Raider coach John Madden provided color commentary.Former New York Giant Frank Gifford was in the booth for the infamous Giants-Bills Super Bowl.There are other examples, at least in football. And, I will admit, I mostly remember Super Bowl crews. I'm sorry, I agree with David…I think your frustrations are ill-placed. If the Cowboys were in the Super Bowl and if Troy Aikman's station won the rights to the broadcast, the same thing would happen. I doubt very much Troy would make some kind of announcement that be bleeds blue with a star in it. People know it, it's a given. St. Louis won this round, the Rangers lost. It wasn't the announcers and they were not the ones that caused the Rangers to lose. As a Cardinals fan, I was offended by the 3 Fox announcers who were for the Rangers that they had before and after the games, but I would not make a big deal of it. The focus needs to be what the Rangers did or didn't do to win. St. Louis has a proud organization with wonderful people. Please do not take away from them because you are upset. They played awesome along with the Rangers also having a wonderful series. Your focus is in the wrong place…all the best to you and the Rangers…great Series. Did you read the whole blog? Because one of my points is that while I'm very happy for you, you can't possibly understand how we feel…not with ELEVEN championships. Buck and McCarver are only catalysts for my feelings, not the 'cause.I'm not taking anything away from the Cards at all. Congrats. Really. Just don't pretend you can understand in any real way. David: My, you have a long and extensive memory of football announcers! Impressive. Thank you, Eric.Actually, during the World Series, while I was monitoring the comments and conversations on Facebook involving my Texas friends, I was also monitoring the comments and conversations from my friends in Arkansas and Missouri, most of whom are Cardinal fans.BOTH sides were complaining that the announcers were biased.It reminded me of a conversation I had with an editor of a smalltown newspaper when I was teaching journalism at the University of Oklahoma.We were talking about political campaign coverage and media bias.He said something I will never forget. "When both sides accuse us of being biased, we're doing our job." To borrow a line from Bill Clinton, I do feel the Rangers' pain.All these years of being a Dodger fan have taught me at least one thing — and it goes back before Reggie Jackson slugged three homers in one game to clinch the title over the Dodgers.There's no point in being a baseball fan if you don't understand that your heart will be broken, sooner or later, probably several times.Heartbreak is heartbreak. I think it is wrong to compare one person's suffering to another's, to suggest that one brand of suffering is more exclusive than another.Which brings me to one of my favorite quotes of all time. It is from Mark Twain. He said, "Nothing that grieves us can be called little. By the eternal laws of proportion, a king's loss of a crown and a child's loss of a doll are events of the same size." Thank you, David. This is really wonderful. I'd never heard that Twain quote, but I've thought similar thoughts myself many times. You're welcome.I've always admired Twain. He always seemed to know the right thing to say. Full disclosure: I grew up a Cardinals fan.Harry Caray, Jack Buck, Mike Shannon, those were the voices that cut through the night on KMOX radio clear channel 1120. Many in the south and west loved the Cardinals. There was no team in Atlanta, no team in Texas, no team in Arizona, no team in Florida. People loved the Cards.But as much as I love the Cardinals, I felt the pain for the Rangers. I came to like and respect that 2011 Rangers squad. So tough from top to bottom. No easy out. No arrogance. A manager who had fun, a manager who brought his teams to the brink two years in a row. I wished he could win. But I'm a Cardinals fan, so my children and I jumped with joy when David Freese hit a two-run double up the gap to tie it up in the bottom of the first in Game 7. Your time will come. You're building the tradition. But know also, that Cardinal fans have been crushed emotionally as well. 1968- The Tigers, behind 3 games to 1…rally to beat the Birds in Game 7. 1985-1987, 2004, heart-breaking. Maybe that pain shouldn't matter, because the Cardinals have won it all, but it's still hurts. And in the moment, history doesn't really matter. It's certainly no salve for the open wound of defeat. But the wound heals, and Spring training rolls around each year. As far as Joe Buck and Tim McCarver…nobody likes em. Thanks very much. As I said, I'm really happy for Cardinal fans, and don't really mean to take one thing away from your sense of joy. Thanks for your encouragement too.Bottom line: it's a great game, isn't it?